This simple pea soup with yogurt & chives is the perfect light starter to a summer meal. I think soup season stretches far beyond the cold months of winter. 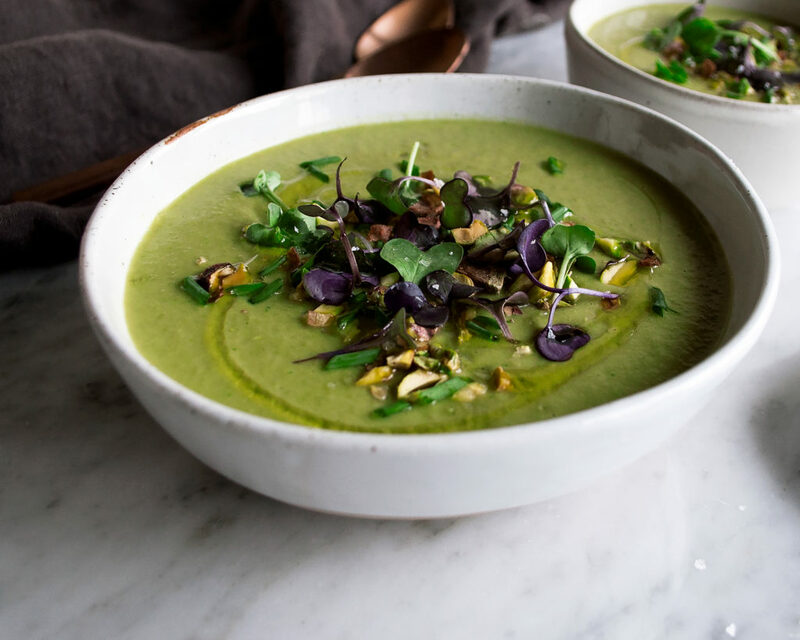 I personally think a nice seasonal summer soup is one of the best ways to start off a dinner. 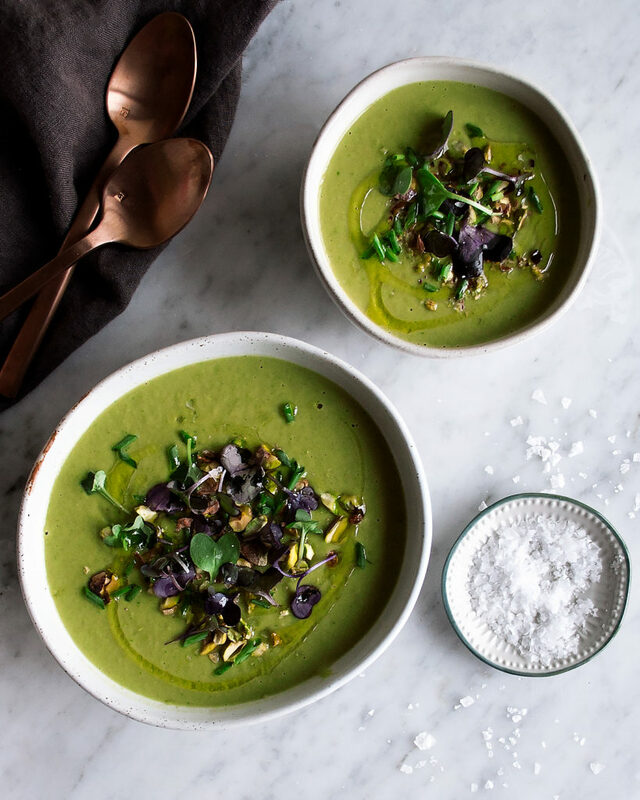 This pea soup comes together effortlessly by using very simple, minimal ingredients. 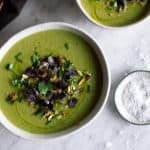 Shallots get sautéed, peas are added, stock is poured in and simmered until reduced, the soup is blended, and final touches are added like spinach for a bright green color and Greek yogurt for a touch of creaminess. You can really add any herbs you’d like, but chives have been doing well in my garden, so I added those and a pinch of coriander. There’s really nothing to it. My perfect summer dinner party menu? Start with this pea soup and these scallops, serve this radicchio melon salad next as a little snack before dinner, kick the main meal off with these peppercorn crusted rib eyes and roasted potatoes with sweet pepper mostarda, and then finish everything off with big bowls of homemade blueberry lavender ice cream. 1. Heat a medium-sized, heavy-bottom pot over medium heat. Add the butter and olive oil. 2. Once the butter has melted, add the shallot. Sauté for about 5 minutes until tender and slightly caramelized. Season with a pinch of salt. 3. Stir in the peas and vegetable stock. Bring the liquid to a simmer. Let simmer for about 20 minutes or so until the peas are tender and the liquid has slightly reduced. 4. 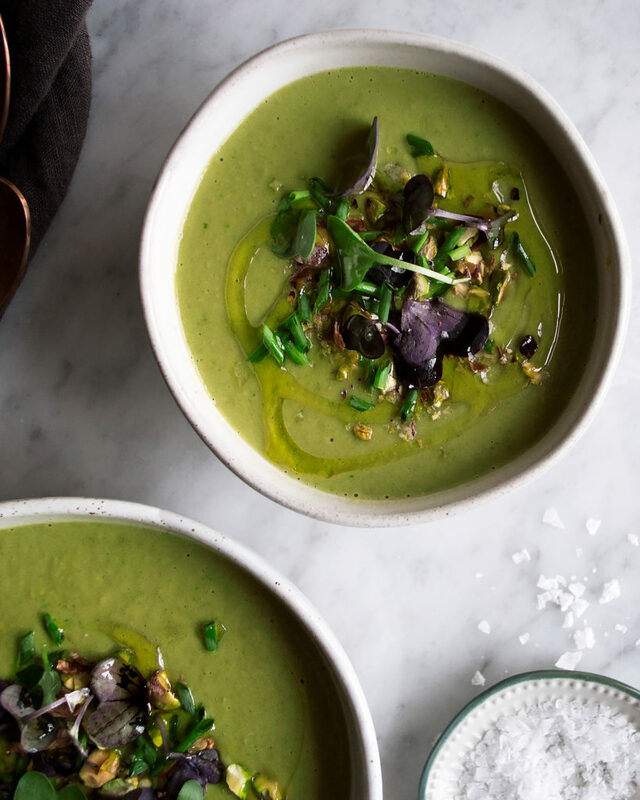 Ladle the soup into a blender and blend until smooth and creamy, about 90 seconds. 5. Add the spinach, Greek yogurt, lemon juice, salt, coriander, and chives. Continue to blend until incorporated. Taste the soup and season with more salt if needed. 6. Strain the soup and serve immediately. Garnish with the pistachios, more chives, microgreens, and a drizzle of olive oil.